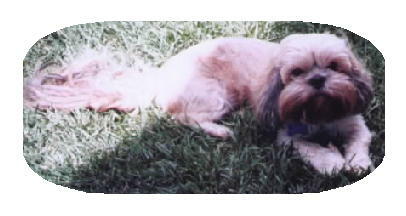 This about our two Lhasa Apso which are two females with papers.My son and his family has a male named George looks like my gizzy,hope too get them together to have some cute puppies,also my white one Ashley should have some cute puppies.I tried last year to get them to mate but it did not work! Maybe the year 2000 will be the year, Make sure to check back to see what kind of cute puppies we will have. As soon as we have them I will take soom pictures and post them on this page.Who knows we might even have a gizzy page and a Ashley page. Did you know when a Lhasa looks in a mirror they see a LION!! 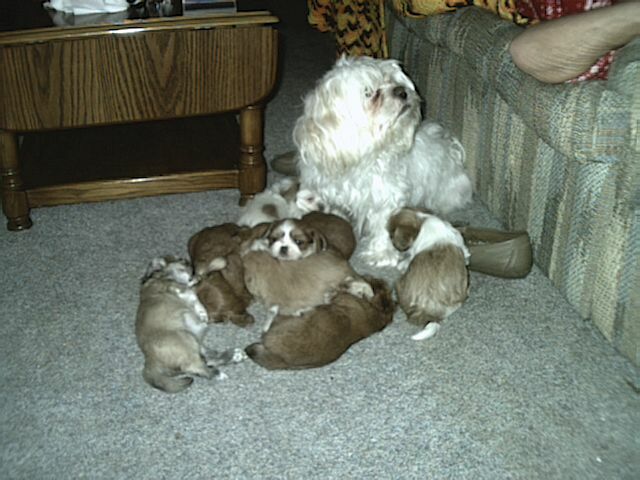 Ashley had seven puppies six girls and one boy,Here is a picture of Ashley and her seven puppies, they should be ready for a home about dec 6 2001. Divorce is not uncommon in this day and age. People come together, drift apart and split. This occurs in couples who marry legally. It also happens to committed but not married people. In this situation, it is not the children alone who may suffer. Dogs are also affected by the problems created by break-ups. Dogs are generally happy creatures. They like to enjoy life. They also are better when their people are happy, too. If a couple they adore and are loyal to are feuding constantly, bickering back and forth, the dog is impacted. Poor Fifi or Rufus is going to be caught up in the emotional maelstrom. If you are in the middle of an emotional break-up, if you are feuding most of the time, your dog is going to feel and show it. Be watchful and aware of the following symptoms. � Physical illness. Your dog will become sick to his or her stomach. � Increased or ever-present anxiety. Your dog will wander restlessly. Separation anxiety may surface where you have never had a problem before. Your dog does not know exactly what is going on, but he or she is worried. A pet senses the change in the environment. He or she notices the separate bedrooms, the increased absences, the packing. In this charged emotional backdrop, the dog has no idea if she or he is coming or going. Why shouldn�t he be anxious? � The dog may become aggressive. This may take the form of siding with one partner over the other. It could also be aggression turned against the perceived causal factor. It may be generic aggression. The pet could become more protective of toys and personal items. The pet may simply be trying to control whatever he or she possibly can. � There are other manifestations of behavioral problem. These vary from dog to dog. The depth or intensity of the effects on the dog and the subsequent acting out or internalization depends on a number of factors. Your dog may be your dog. It may actually glad of the break up. On the other hand, the dog may be both your dog. Its loyalties may be evenly divided. He or she may look at you as a unit, each with a specific purpose. In my home, I am the major care giver; my partner is the chauffeur. The prior problems and emotional upheaval disrupts the routine. This is a major problem. Dogs, like people, are used to and comfortable with routine. Another problem, beyond the emotional upheaval is the uncertainty. A dog does not know what is actually going on. If packing is involved, your pet is not truly aware of where he or she is going and with whom. In some divorces or separations, this is heightened. The dog actually becomes a pawn in the divorce. One partner may try to manipulate the other through the dog. The poor animal becomes a tool for leverage. If you are going through a divorce, please consider the feelings of you and/or your partner�s pet. In spite of what the law says, your pet is NOT a possession. He or she is a sensitive, caring animal deserving love, attention and security. The finality of a divorce may bring about a restoration of order. The final separation introduces a sense of normality. Dogs do love routine, but they are adaptable. A change in routine is better than a tumultuous chaotic life or an unsettling void. Routine means the return to a feeling of security. Even is the two of you end up sharing the dog, you can make sure he or she continues to enjoy whatever the two of you have and bring to the important relationship � between you and your dog. Content written by Lacy Hill of www.ohmydogsupplies.com, the top shop to purchase dog robes online. It is becoming more acceptable to turn to alternative treatments to help your dog lead a healthy life. Using herbs is one form of alternative treatment. It can work in conjunction with established medical treatments. It may be used on its own. It can also act as a supplement to other alternative treatments. Whatever its chosen application, you need to be clear to all involved what medications are involved. Herbs are a form of medicine. As such, they deserve respect. As a result, you need to inform all concerned about the various medications you are giving your dog. This way, you can prevent counterproductive combinations or, worst still, seriously affect the health of your dog. In this look at herbs, we focus on herbs intended to help with cardiovascular problems. There is also a look at herbs used for respiratory problems. Herbs For Cardiovascular Problems I addressing health issues surrounding the cardiovascular system, there is one major use of herbs. This is to strengthen and support all functions concerning this system. Herbs are to help it function normally and increase its efficiency. To address this issue, you can subscribe to giving your dog a mixture of various herbs. You will have to consult with a herbalist in order to obtain the right proportion. It is also possible you can obtain the medication from a natural specialist store. Frequently, you will find the following drugs used alone or in combination to act as a tonic. � Hawthorn - This is taken as a daily supplement. Its role is to improve coronary blood flow. It also moderates the dog�s blood pressure while strengthening the animal�s heartbeat. You can also employ a vaporizer in the dog�s kennels or rooms. Add a few drops of eucalyptus oil combined with water. The vapor of this preparation should open any closed respiratory passages. This will help your animal to breathe. Never forget, when you place your trust in herbs but are still relying on another system of treatment, consult all involved parties. Never go ahead and begin a herb regiment without considering the possible effects of mixing and matching different types of medicines. Talk to your veterinarian, homeopath and any other individual currently treating your dog. Only when everyone is aware of the possible effects of specific combinations or individual herbs on your dog, should you go ahead with the administration of herbal remedies. The next part of this series on herbs and canines will continue a look at respiratory problems. It will provide a list of herbs used to treat pneumonia. It will also consider the use of herbs in both removing toxins from the body and as supplements. Article provided by Jess Gerard of www.ohmydogsupplies.com, check out our diverse assortment of designer dog collars online. Have a great day and thanks for stopping bye!! !